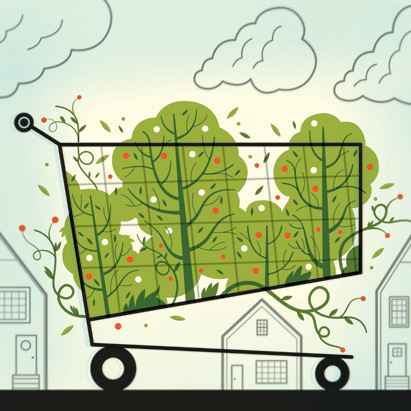 Growing Beacon Hill’s new Food Forest will take a village—but it will also feed one. Funded in part by the Seattle Department of Neighborhoods, and planted and maintained by dozens of volunteers, this public Garden of Eden—including fruit and nut trees, mulberry bushes and snack paths of strawberries—will break ground this fall and is due to bear its first harvest starting in the summer of 2013. Unlike the city’s many P-Patches, where the garden food belongs to whoever does the planting, anyone—even passersby—will be allowed to pick from the Food Forest. And while at P-Patches, the ever-revolving plots are planted with annuals such lettuce and tomatoes, here, the main plantings are perennial, such as fruit and nut trees and berry bushes. The forest is the brainchild of local proponents of permaculture (a word invented to mean “permanent agriculture,” a sustainable philosophy first defined in the 1970s) and will take root on a sunny slope just below Jefferson Park. For decades, neighbors have been cooking up ideas to develop this open space on the Seattle Public Utilities‒owned property, says Jenny Pell, a Seattle permaculture designer who specializes in edible landscapes and has played a key role in the forest’s design. The dreams began to materialize at Pell’s six-month-long permaculture workshop in 2009, when participants designed a food forest as a class project. The group applied for and won a $22,500 Seattle Department of Neighborhoods grant, most of which went toward creating a more comprehensive design. With permaculture principles at the fore, the expanded design (by Pell and Margarett Harrison, principal at Harrison Design Landscape Architecture) gives consideration to how natural features—including soil, rainwater, insects, and the new plants and trees on the site—will work together. Food Forest organizers held three public meetings (required by the Department of Neighborhoods) to gather requests from the community before starting the official design. Neighbors responded enthusiastically. Twelve Chinese grandmothers came to one meeting with an interpreter, and lit up when they learned the Food Forest could include some fruits and berries, such as the yang-mei berry, that they couldn’t get elsewhere. People asked for bees, areas for kids, classrooms, orchards, berry fields and bike racks. The Veterans’ Hospital, just steps away, is discussing the possibility of a therapeutic garden program. Alongside the Food Forest, separate areas on the acreage are being set aside for individual garden plots, as well as larger allotments of shared garden space for groups that want to grow together, using a P-Patch model. Partial funding will come from the 2008 Parks and Green Spaces levy, but additional volunteer fundraising will be required to cover much of the seed and plant costs. Volunteers will start by building up the soil and planting about 1.75 acres with trees and plants this fall. The forest will include a nearly 2-acre native edibles area with salal, salmonberries, huckleberries and thimbleberries. Snack fruits, such as raspberries, will be planted alongside a field where kids play. Everything will be organically grown, with no synthetic fertilizers or pesticides. Strawberries and blueberries will likely be the first to ripen, some by next summer. The fruit and nut trees will be a longer-term project, bearing after anywhere from three to seven years in the ground. But once they do, harvests could be ample—Pell says walnut trees planted on-site could produce around 30 bushels of nuts on one tree. If all goes according to plan, the harvests could dwarf what would be possible on the same space if it were strictly planted with rows of vegetables. “Fruit is valuable because you can grow a lot of food on a really small footprint,” says Gail Savina, executive director of Seattle nonprofit City Fruit, which helps to protect, promote, educate and help with the harvest of urban fruit trees. At this time, no money has been allotted for that purpose, but raspberry patches will require thinning, the Chinese hawthorn trees might need pruning, and someone will likely have to go ’round the mulberry bush with a pair of clippers. Based in permaculture techniques, the plan has been carefully designed to cut down on maintenance. (For example, planting an understory of berries beneath trees will greatly reduce the need to weed and water.) Nonetheless, says Raymond, “The community is really going to have to get themselves organized to make sure there is a good harvest plan.” But, she says, community building is part of the point. Volunteers have formed a Friends of the Beacon Food Forest committee (beaconfoodforest.weebly.com) and are holding free workshops, such as fruit tree pruning, for people interested in helping to care for forest plantings. So what about the possibility that people will grab more than their fair share? “That’s a concern,” says Margarett Harrison. “But we feel like there will be enough eyes on the site that enough people might discourage those who want to take more than what they need,” she says. In other words, the plan to fill the place with not just gleaners, but veterans, kids, P-Patch gardeners and Chinese grandmothers should keep any one person from feeling free to grab it all. The Food Forest isn’t exactly in the middle of nowhere, either. East of the sunny Beacon Hill slope with a glorious downtown view, Jefferson Park is chock-full of amenities to draw eager grazers and gazers, with a skateboard park, putting green, playground and a spraypark set to open this month. Ball fields here have hosted everything from pickup soccer games to Samoan cricket matches.